The Glitch. The Glitch first popped up in May of 1981 in a small suburb of San Jose. 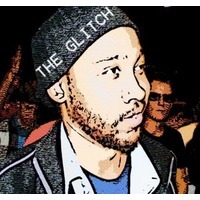 The Glitch has come here for one purpose and one purpose alone, to spread harmonics and to Wallify sounds. The Wall of Sound movement has found a new pioneer. Early on, The Glitch was observed in taking in a mass amount of music from Beethoven and Bach to Psykosoniks and 2 Unlimited, to The Beatles and The Beach Boys, to Phil Spector and Dr. Dre. Love the sound, this is tight.